Thanks to everyone who contributed feedback to our visual demo last week. While we are still working out some aspects of our environment art, we appreciate both the kind words and the suggestions for improvement that we received. Due to all of the coverage we received, we noticed a lot of new folks asking about the game as well as past backers who may have missed a lot of the updates that have happened since the Kickstarter campaign ended. We thought it would be a good idea to restate what Project Eternity is all about and update our FAQ. While much of this has been covered in previous updates, we have also included a few new tidbits of information in the details. Project Eternity is a party-based fantasy roleplaying game inspired by the Infinity Engine games (Baldur’s Gate 1 and 2, Icewind Dale 1 & 2, and Planescape: Torment) set in an original world created by Obsidian Entertainment. The camera has a fixed axonometric (high angle) perspective (with zoom!). The environments are 2D backgrounds combined with 3D characters and visual effects. Unique, beautiful, dynamic environments that encourage and reward exploration. A story that is both personal and far-reaching, with believable characters and factions that create compelling dilemmas for players. Fun and challenging tactical combat that can escalate in difficulty through the use of optional game modes. What does “party-based” mean in Project Eternity? At the start of the game, the player can create and customize his or her character, choosing from six races and several ethnicities, eleven classes, and a number of cultural backgrounds. Over the course of the game, the player can expand his or her party up to six total characters. 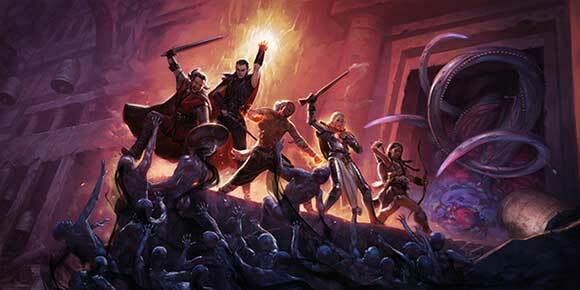 The additional characters include eight companions designed and written by Obsidian as well as any new characters players would like to build at the Adventurer’s Hall. What is the combat like? Project Eternity’s combat will feel very similar to the combat in the Infinity Engine games, which used a “real-time with pause” system. In such a system, events between combatants occur simultaneously, but the player can pause the game at any time. The player selects and commands one or more of his or her party members to issue orders, ranging from continuous activities, like making standard attacks, to the activation of limited-use tactical abilities, such as spells. Like the Infinity Engine games, Project Eternity will support auto-pause features that allow players to establish conditions under which the game will automatically pause (e.g., if a party member becomes unconscious). It will also feature a slow combat toggle that can be used with or in lieu of the pause feature. In slow combat, players can manage the flow of combat without needing to halt the game entirely. What are the different races we can play? Players can select from six main races found in this part of the world: humans, elves, dwarves, orlans, aumaua, and godlike. Orlans, aumaua, and godlike are unique to the world of Project Eternity, though godlike have similarities to “planetouched” races in other settings. Orlans are small humanoids physically notable for their two-tone skin, extensive body hair, and extremely long ears. 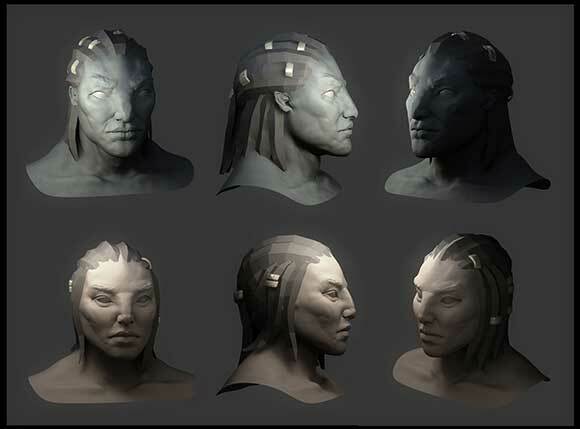 Aumaua are large, semiaquatic humanoids with a diverse array of skin patterns, elongated heads, and semi-webbed hands and feet. Godlike are not a separate race, but a phenomenon found among all races. They are individuals whom many people believe were transformed by the gods before birth. Godlike have distinctive appearances that invariably make them stand out from other people, with different cultures and individuals holding wildly different biases toward or against them. All of the races have different ethnicities from which the player can choose. For elves, Wood and Pale, for dwarves, Mountain and Boreal, for orlans, Hearth and Wild, and for aumaua, Island and Coastal. Humans have three ethnicities: Meadow, Ocean, and Savannah. Godlike can be found among any race and their appearance always sets them apart from their parents. This is an Aumaua male and female hi-poly head model. The facial colors and texture will be coming later. Characters may be one of eleven classes: barbarian, chanter, cipher, druid, fighter, monk, paladin, priest, ranger, rogue, or wizard. The “core four” classes (fighter, priest, rogue, wizard) are most similar to their traditional tabletop analogues. The non-core classes, barbarians, druids, monks, paladins, and rangers, are somewhat similar to their counterparts but differ more significantly. The two completely new classes are the chanter and the cipher, which are unique to the world of Project Eternity. Traditional classes vary in how high- or low-maintenance they are based on their traditional counterparts. E.g. fighters are generally lower maintenance than wizards. However, the advancement system allows players to bend those roles, making higher-maintenance, active-use fighters or more passive wizards (for example). Class balance is important to us, but we also want playing each class to feel distinctive and complementary to other classes. What will the art style be like? Our art style is fairly realistic and uses a somewhat subdued, natural color palette, especially in outdoor environments. Character proportions are also fairly realistic. Equipment designs and proportions are based on their earthly historical counterparts, with an overall emphasis on function in their form. However, because this is a fantasy game, many environments will also be fantastic, with unearthly architecture, unusual materials, brilliant colors, and beautiful embellishments when appropriate. How about the setting and story? 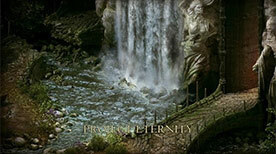 Project Eternity is set in a world created by Obsidian Entertainment, where mortal souls are bound to an eternal, and often mystifying, cycle of life and reincarnation believed to be watched over by the gods. Though cultures and individuals have different beliefs about the nature and purpose of this cycle, it is only recently that mortals have made significant advancements in understanding its fundamental mechanics through the science of animancy. The story takes place in a small nation in the world’s southern hemisphere called the Dyrwood (DEER-wood). The Dyrwood is a heavily forested, coastal region where colonial powers from across the ocean have settled and formed an uneasy relationship with the local residents, tribes of orlans and elves who are protective of the ancient ruins of Eír Glanfath on the forest’s interior. Eír Glanfath was an ancient melting pot of races that built elaborate, often massive, structures out of a living shell-like substance called adra. Though the fate of the ancient Glanfathans is unknown, their dangerous and complex ruins show evidence they possessed extensive knowledge of how souls work. For this reason, all of the surrounding colonial powers aggressively fight for the chance to explore and plunder Glanfathan structures, often bringing the local tribes into conflict with their relatively new neighbors — and the neighbors into conflict with each other. The central character in the story is a newcomer to the Dyrwood, a man or woman who is caught up in a bizarre supernatural phenomenon. This event puts them in a difficult position, where they must explore the new world to solve a series of problems that have been thrust upon them. What engine does Project Eternity use? Project Eternity uses the Unity engine in addition to proprietary features developed at Obsidian. What platforms will Project Eternity be available on? We will be releasing Project Eternity for Windows, Mac, and Linux PCs. It will be available through Steam and GOG.com. Will Project Eternity use any form of DRM (digital rights management)? The GOG version is DRM-free. The Steam version works like any other Steam game and does not have any added DRM. There is no online requirement to play the game nor any additional DRM imposed by us. What languages will you be supporting? In addition to English, Project Eternity will be released in French, German, Spanish, Polish, and Russian. What resolutions are you supporting? Project Eternity will support resolutions from 1280x720 and up. Our environments are rendered out at a high resolution and support a wide range of scalability. What other cool stuff will be in the game? Thanks to our backers, players will have access to both a player house as well as a full stronghold in the game. Also, players will have the chance to explore all fifteen levels of the backer-funded mega-dungeon, the Endless Paths of Od Nua. Players who want a more extreme challenge can enable up to three optional game modes: Expert Mode (turns off “helper” features), Path of the Damned (dramatically increases the difficulty and complexity of encounters), and Trial of Iron (only one save game, party death = game over, save game deleted). That’s all for this week. Thanks for reading! Season 1: Cowardly Cops, Meddling Merchants, and Shrouded Hills. And trash bins. We’re doing something different with the Arcanum playthroughs with this update – instead of filming a large portion at once and then releasing that one session over several weeks in small 10 min chunks, we’re going to release smaller updates that allow us to respond more quickly to your feedback on the playthrough and then iterate on the next playthrough. In this episode, Avellone explores the small town of Shrouded Hills, deals with cowardly constables, explores trash bins, and finds out more about the cryptic ring from the Zephyr’s zeppelin crash. Virgil guest stars.